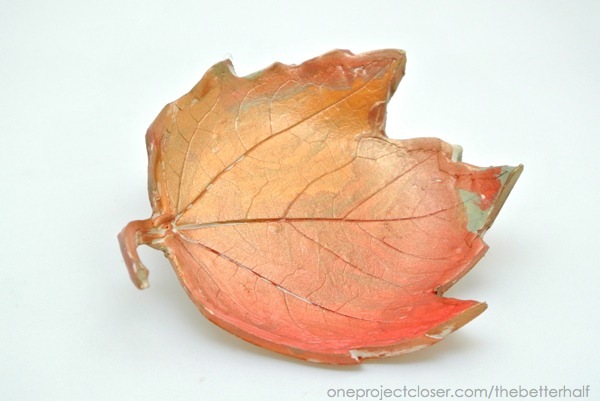 Hi, my name is Jocie (pronounced Jah-see) and I’m from One Project Closer. I love all things DIY, crafts, and food. One Project Closer is a team effort along with my husband, Ethan and our best friends, Kim and Fred. Ethan and Fred tackle the hard-core DIY, I rock the softer side of DIY, and finally Kim works to provide the most up-to-date Home Depot coupons on the web! We hope you’ll follow along with our fun on Facebook and Pinterest! 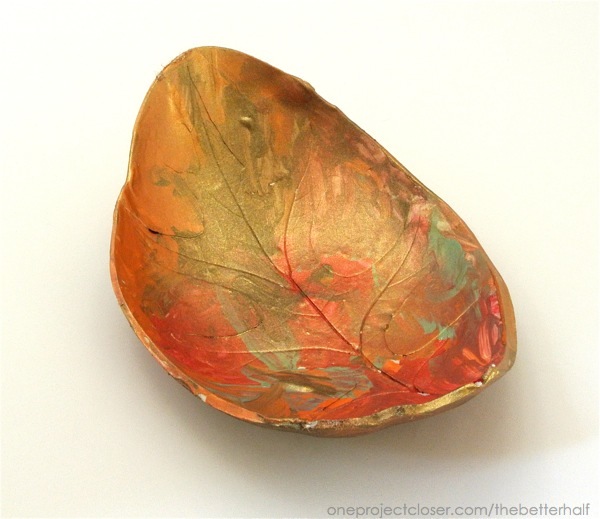 Clay Leaf Bowls are one of my all-time favorite projects because it’s simple, inexpensive, fun to do with the kids, and really beautiful! Oh, and there really is no way to mess it up (because sometimes I do that). But every imperfection just makes it a little more personal and unique. First, me and my girls picked bunches and bunches of leaves fresh off the trees (not the dead, brittle ones on the ground). 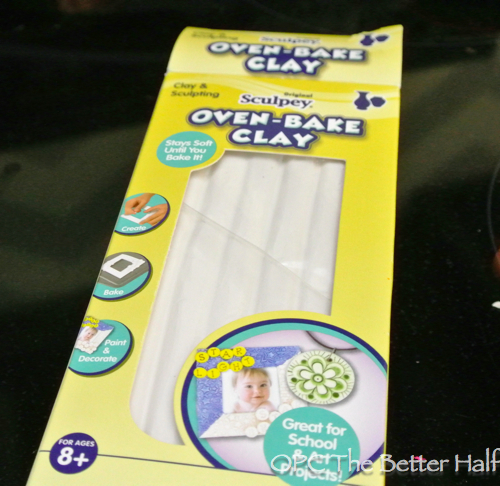 Then, I pulled out my oven-baked clay – love this stuff! 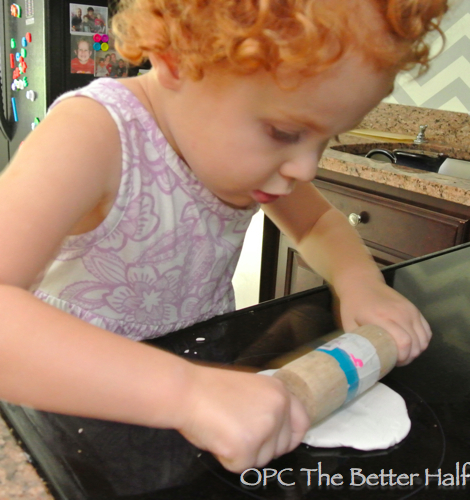 We worked the clay until it was warm and soft, then rolled out the clay, thin and even. This picture is of my daughter last year at age 3. When it was cold, she couldn’t do much with it but it was fun watching her try. lol. 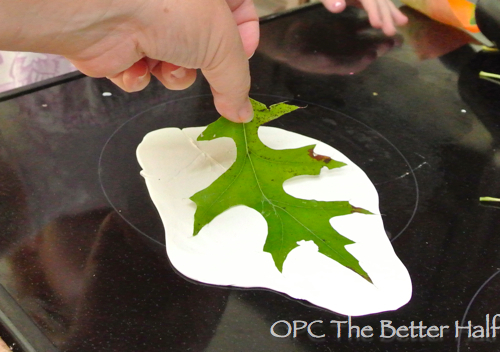 Then, I placed the leaf in the center of the clay and used the rolling pin to press it into the clay. I pressed harder than I thought I needed too and then lifted it off the clay, starting with the stem. 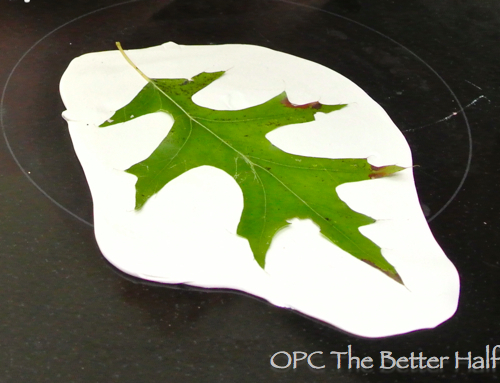 I thought about keeping the excess around the leaf print to have it look more like a bowl, but I ended up cutting around the leaf with a sharp knife. Obviously, the kids didn’t help with this part. 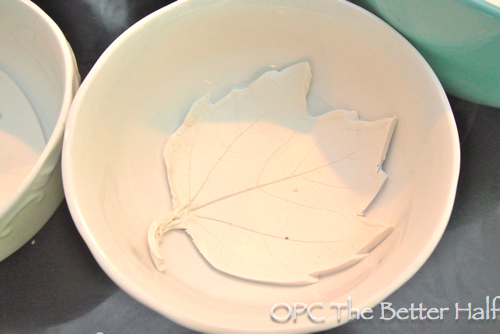 Once cut, I lifted the clay leaf and placed it in one of my stoneware bowls, since they are oven-safe and cooked as directed on the box. Once removed from the oven and completely cool, I gave the girls some acrylic paint and Q-tips and let them get to work! 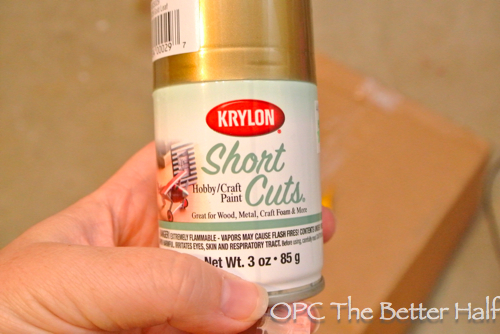 Tip: Yellow and gold paint did not look as good on the final product, so we stayed clear of those colors. 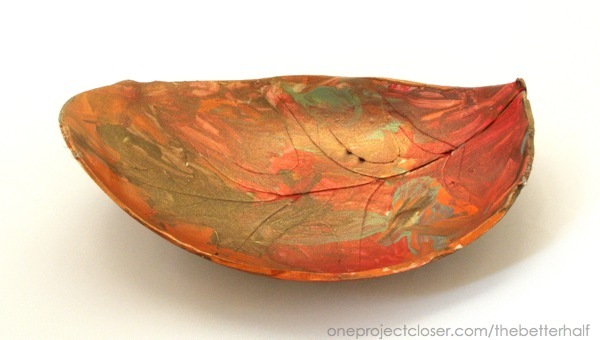 Then, after the acrylic had dried, I lightly spray painted the bowls with gold metallic spray paint. The trick was to hold the spray paint at a distance and spray very lightly. You can always add more, but if you spray too much, you won’t be able to see any of the fabulous colors! I used this same technique making ornaments last Christmas and those turned out awesome too. I imagine Debbie could also put a fab spin on this with some Rit Dye! Like both of our sites on our combined Facebook page! Follow One Project Closer’s Pro-Follow updates on Twitter! 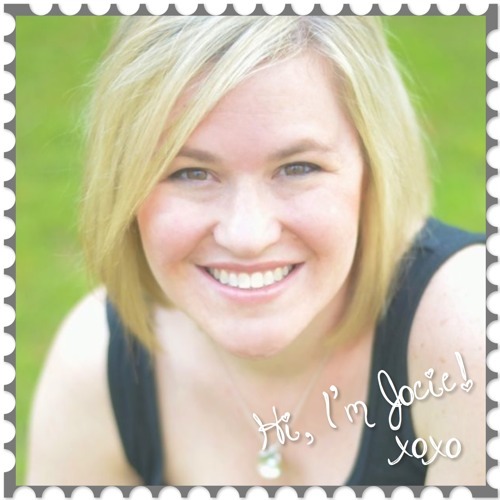 Follow Jocie & The Better Half on Pinterest! Hi girls! Those (and your daughter!) are darling. So pretty and the colors are just rich and vibrant. They really capture the essence of Fall!! First of all, your daughter’s hair is to die for!! I love it. How did you make the bowl curved instead of flat? Do you bake it inside the other bowl? Great project! 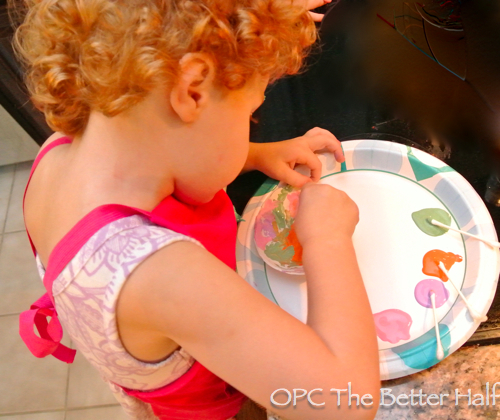 So great for the season and you have a sweet helper there. How cute…!! I like it your sweet daughter has done a fantastic job. She looks completely dedicated for this work..!! I really love these. I wish we had larger leaves around here to use. I need to keep my eyes open to see if I can find some or ask the the husband to bring home some from his slightly northern travels. First of all, your daughter’s hair is to die for!! I love it. 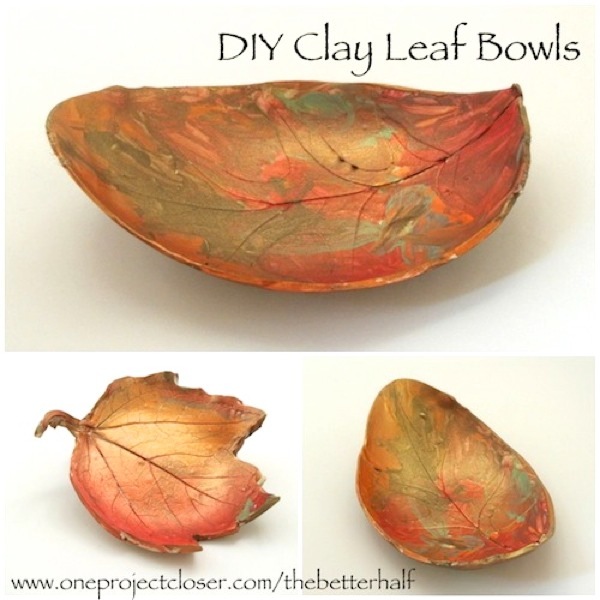 Really, love your idea of making Clay Leaf Bowl. It is nice that kids also feel excited doing that. Thanks for sharing this different idea. Love this idea! 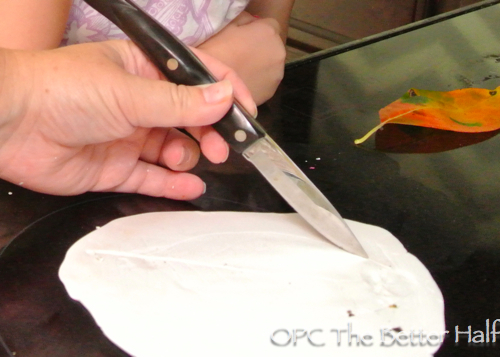 I am going to totally try it with sunflower leaves! They are bigger than my head right now. Do you think sculpey clay would work?